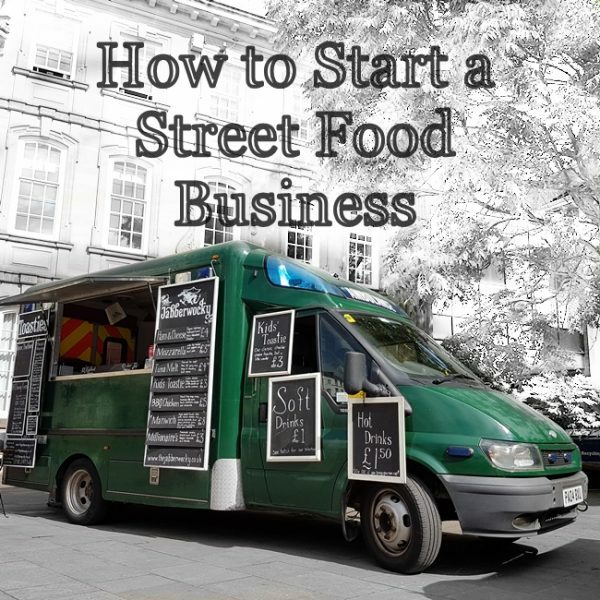 There are many things we still need to learn about street food, the idea being that each one will move us slightly closer to a business that is happy, prosperous and maintains a firm stance on the importance of tea. This weekend we were at Barefoot Festival in Leicestershire, and learnt a profound lesson about tables, and several minor side-lessons on the topics of camping, light and sticky toffee pudding. I will do my best to share these with you, partly because that’s how this blog works, and partly because perhaps it will help someone in the same situation. Tables. I have never really considered it, but we Brits sit while we eat. Even if we take no pleasure in the food itself, we must always be seated for the process. My theory is that it is something to do with tea, because way back in the day, in that period now lovingly referred to as “vintage”, we decided that we needed at least two items of crockery for a single cup of tea. This means that the mere act of drinking requires two hands, and you have no choice but to be near a table. The Jabberwocky currently does not have tables. We should have forseen this problem when we realised that most of our customers at the Stratford River Festival were sitting on next door’s seats, but decided it was something for next year, once the Beast had started to pay for himself. This weekend, as we looked out over the other food vans, it was much clearer that seating is directly proportionate to customers, and that tables are a necessity, not a luxury. The Jabberwocky needs tables or, to be more precise, tables and chairs, because chairs on their own look uncomfortable and silly. Camping. I remember it being pretty amazing back in the day, but it is a lot louder than it used to be. Especially when the people around the camp fire have percussion instruments, and the food concession next door has a refrigerated van. My advice, should you find yourself in a similar situation, is to forsake your food truck, and go and find somewhere quiet to sleep. When the drumming is still going on at 5am you will thank me. Just don’t stray too close to the toilets. The light was something we had never considered, because we have only ever thought about using it to see. After dark though, the main purpose of light is not to see, but to be seen. 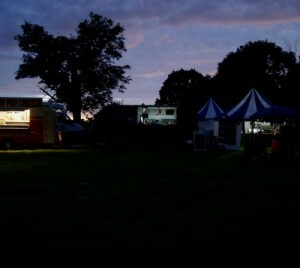 The poor Wocky, with only minimal lighting, was lost as night crept in next to his beaming colleagues. It is easily remedied though, and nothing says “classy food establishment” quite like green fairy lights. Although we’re still working on that. 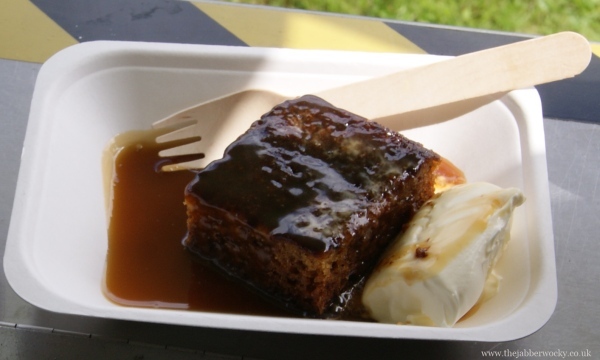 Finally there remains only sticky toffee pudding. I occasionally get carried away when I’m talking about food, but on this occasion I think there is no other way to go about it. Added to the menu only as an afterthought, it was so light, so moist and so shamelessly naughty that it deserves a place in the history of food. I kid you not, this was a dessert that people told friends about, and coveted, and came back for day after day. It was light and melting but at the same time deep and dastardly. If you ever have a chance to try it make sure you do. I promise you will get a full refund if you are anything less than swept off your feet with delight.